Above: Montrell Taylor and his mother Nina Scroggins, an assistant cook at Hopkins Hospital, demonstrate for better pay for service workers. An employee who’s a Tea Party Republican. Another who’s a struggling single mother. 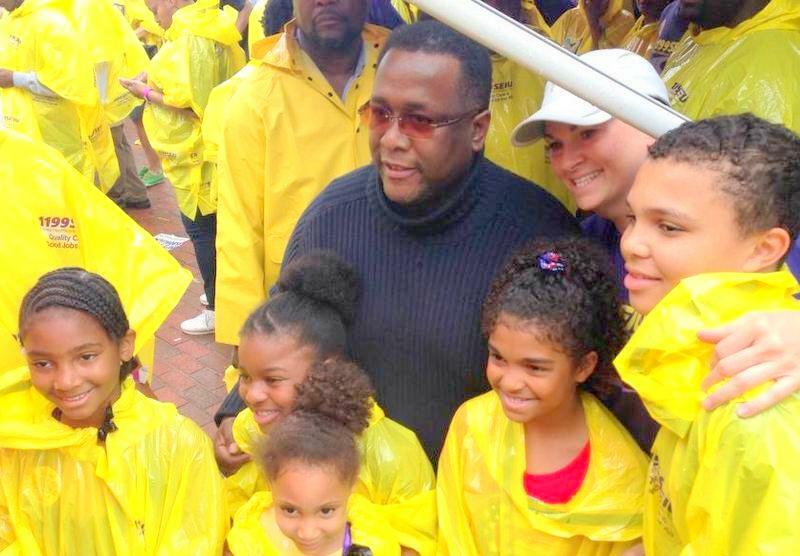 Actor/activists Danny Glover and Wendell Pierce. 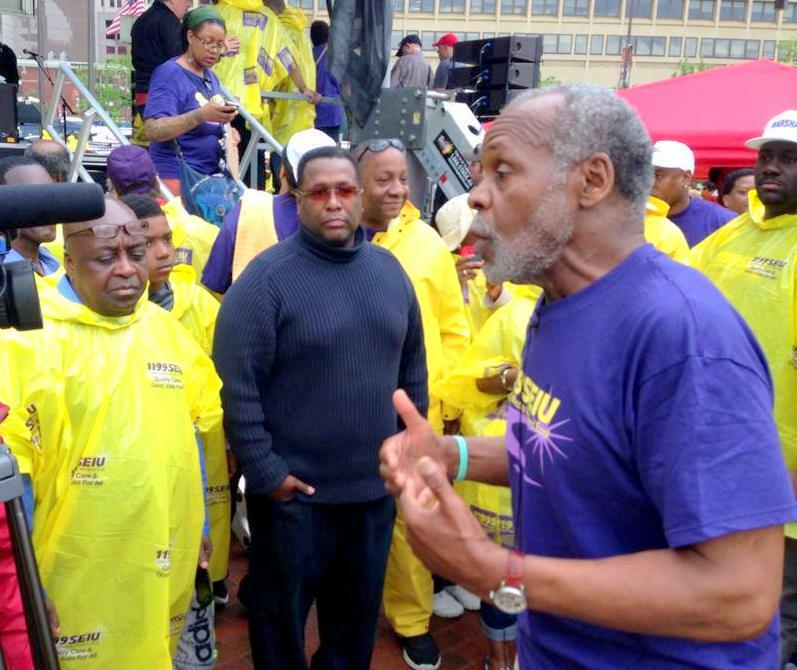 The union that has been pushing Johns Hopkins Hospital to increase pay for service workers brought a diverse and star-studded lineup to the stage yesterday to address the crowd of about 2,000 assembled for a rally at Baltimore’s Inner Harbor. 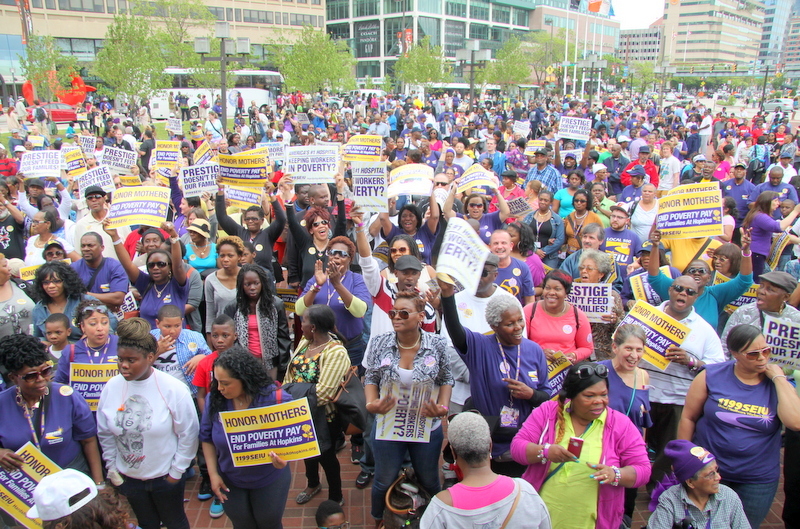 But plenty of the people in the crowd – many sporting purple 1199SEIU United Healthcare Workers East shirts – seemed equally able to make the union’s case themselves, often from personal experience. “They’ve got to pay more so we can support ourselves. I work so hard and I am barely making it,” said Nina Scroggins, an assistant cook who has been working at Hopkins for seven years and is a single mother of three. Standing in McKeldin Square within sight of the tall-masted USS Constellation and other Baltimore tourist attractions, Scroggins said she still makes the starting salary for her position, $12.32 an hour. Despite putting in long hours, she said, she lives paycheck-to-paycheck and is barely making it. “I have no tags on my car because I couldn’t afford to pay for them. I had to catch the free bus to get here,” she said, referring to the Charm City Circulator. She said she couldn’t afford to pay the registration fee for her car because she needed the money to cover her gas and electric bill. She said she would like to advance to the higher-paying title of “cook,” but the certification process “costs like $200 and Hopkins won’t pay for it,” she said. But as Scroggins told her story – and a band played rousing rally standards like Bob Marley’s “Get up, Stand up,” Stevie Wonder’s “Living for the City,” Sam Cooke’s “A Change is Gonna Come” – it became clear that she and others were feeling pretty optimistic. 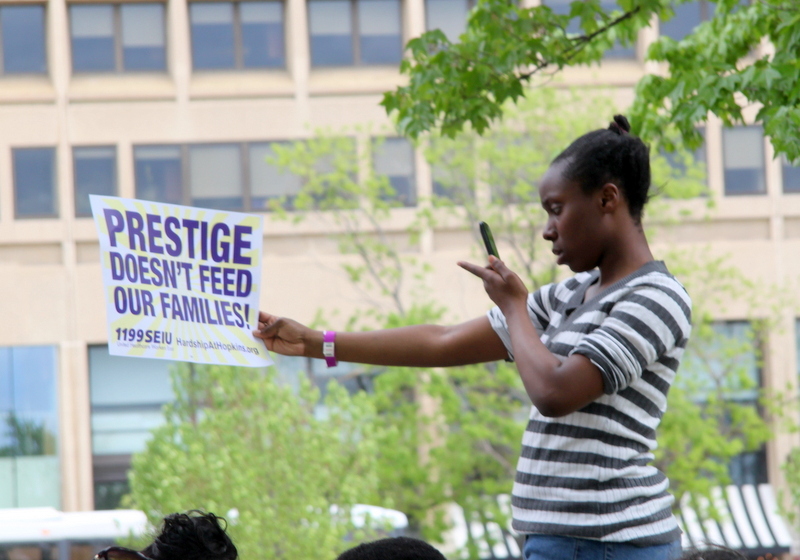 1199SEIU, which represents about 2,000 cooks, housekeepers, technicians and other workers, staged a three-day strike last month. But negotiations with Hopkins ended talks without an agreement. 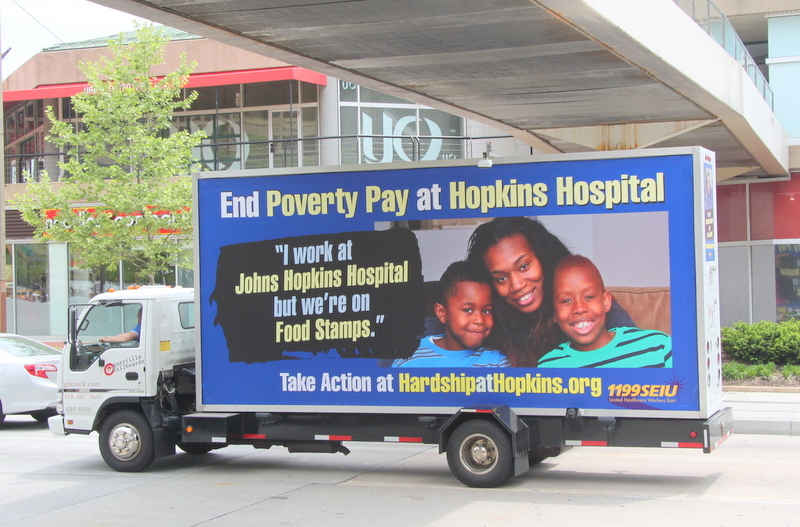 Mounting an aggressive public relations campaign in local and national media, the union has said current pay levels at Hopkins are so low many caregivers are on food stamps, Medicaid or other public assistance. Nearly 70% of Hopkins caregivers make less than $14.92 an hour, the wage that qualifies a single parent and child for food stamps, they say. 1199SEIU is pushing for a $15 minimum wage for Hopkins workers with at least 15 years of experience in the first year of a proposed four-year contract. (Workers now make between $10.71 to $27.88 per hour.) Under the union’s proposal, every worker would be earning at least $14 an hour by the end of the contract period. Hopkins has said it treats its workers fairly and will continue to meet with workers in good faith, but that it will not discuss negotiations in the media. Peterson described Hopkins benefits as “one of the most generous benefits packages we know of offered by any employer” and noted that they include health care coverage, pensions and education and tuition reimbursement. At the event organizers called “Mothers March and Rally for Justice at Johns Hopkins,” speakers included two members of the bargaining committee, Kiva Robbins and Bob Domulevicz. A self-described “Tea Party Republican,” Domuleveicz, a biomedical maintenance mechanic, said “Hopkins should be ashamed” about how it treats its workers. 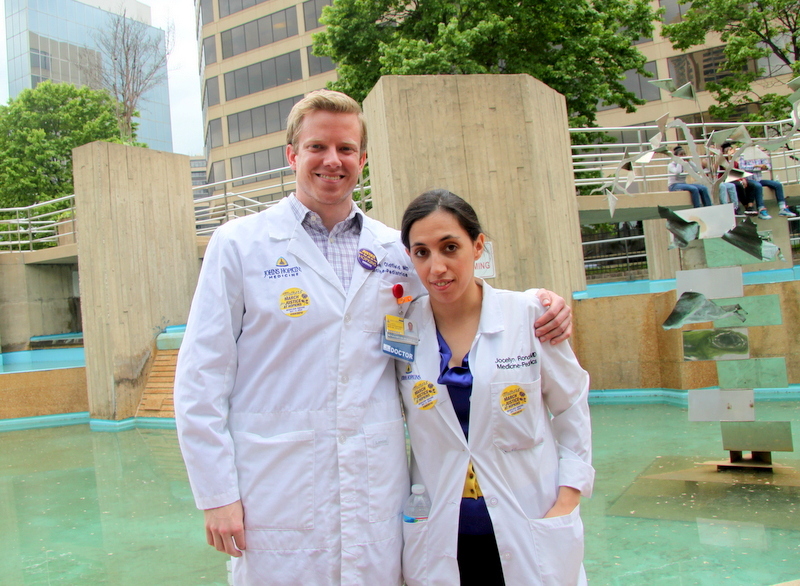 Valerie Caldas, a student of international public health at the Johns Hopkins Bloomberg School of Public Health, found irony in the hospital’s wage scale for service workers. “Improving wages improves health. It has been taught to us over and over again,” she said. 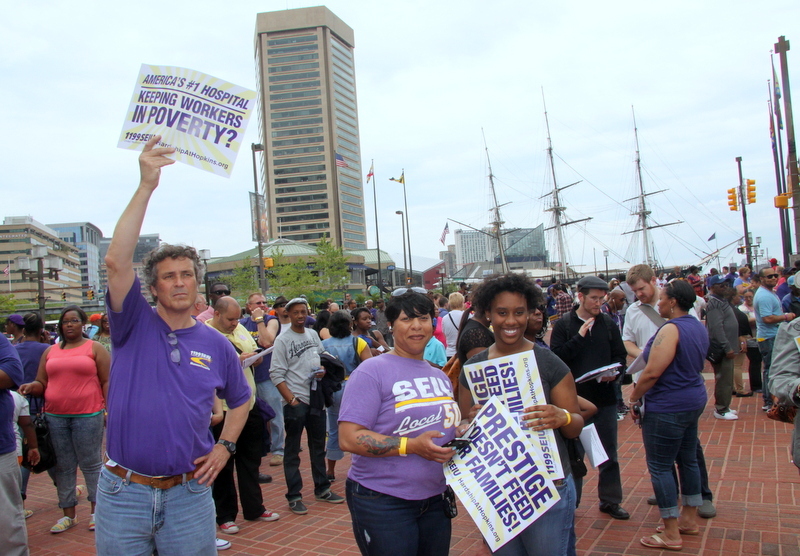 “This is a fight for workers not only here in Baltimore, in Maryland, in the region, but workers in this country and workers around the world,” said Glover. 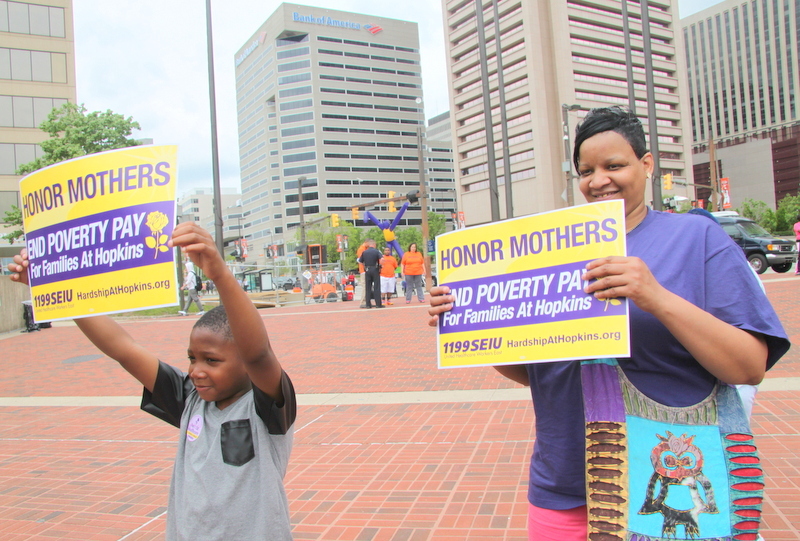 Although the event was meant to tie in with Mother’s Day today, organizers also invoked some unique history which has to do with the year – 2014 is the 45th anniversary of the Hopkins workers’ vote to unionize with 1199. 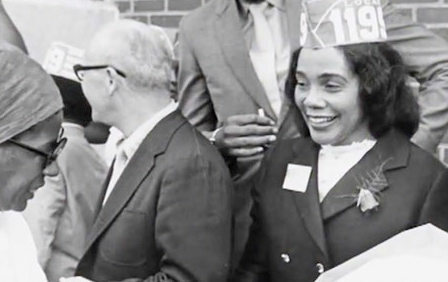 That 1969 campaign drew support from Coretta Scott King. Her visit, union leaders say, helped galvanize the drive to unionize workers doing the lowest-paid work at perhaps the most powerful institution in town. King made her visit to Baltimore a year after her husband, civil rights leader Martin Luther King Jr., was gunned down in Memphis. Several longtime union members who addressed the crowd were there and recalled those days. “If it wasn’t for the union, I wouldn’t be here today,” said an emotional Annie Henry, an instrument processor at Hopkins who has worked at there for 45 years. Speaking with The Brew, Henry said she will never forget hearing King’s widow speak on that August day.